Integrating the company's most recent advances in loudspeaker, electronic, software and networking technologies into a seamless sound reinforcement package. All transducers in a VIO L208 module work with a panel that serves as both a phase plug and an HF horn. 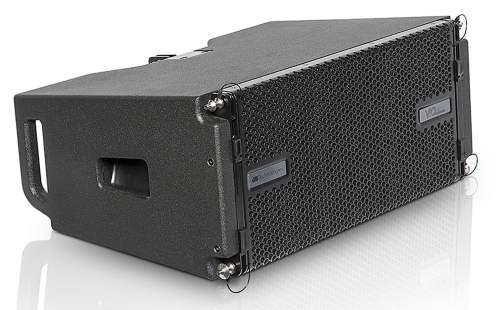 The new dBTechnologies VIO L208 compact active line array and VIO S118 R active subwoofer integrate all of the company’s most recent advances in loudspeaker, electronic, software and networking technologies into a seamless package designed to meet a range of sound reinforcement applications. A 2-way design weighing less than 40 pounds, each VIO L208 element has a proprietary Digipro G3 class D amplifier (900 watts RMS) and a deep digital signal processing suite matched with dual 8-inch neodymium woofers and a 1.4-inch neodymium compression driver. All of the transducers feed an “all-in-one” panel that acts as both a phase plug and a high-frequency horn, with the waveguide behind this panel contributing to the creation of a cylindrical wavefront that optimizes HF performance, in particular enhancing coherency at longer distances. This is further honed by linear-phase FIR (Finite Impulse Response) filtering in the DSP that brings added linearity to phase response in addition to optimizing the crossover between transducers, enhancing their interaction as well as affording improved coupling between arrayed modules. The DSP also provides presets for maximum acoustic customization and tailoring. The VIO L208 can act as a stand-alone system in addition to serving as a fully compatible down fill for VIO L210 (10-inch) arrays. And as with the VIO L210, the VIO 208’s wooden enclosure comes equipped with a built-in rigging system intended for simplicity and speed. A back-central rigging strand allows setting relative splay angles directly in the dedicated transport cart (model DT-VIOL208), which is able to house four modules and a fly bar. While lifting the array into position, the rigging strand automatically blocks the modules at their preset angles, and it does so without the need for heavy lifting. A dedicated 3-point flying frame (model DRK 208) facilitates the setting of precise inclination of the array. The frame can also carry an optional inclinometer laser pointer for even more aiming precision, and when not in use, it stores easily in the transport cart. Another accessory (model AF-VIO1) fosters rigging modules under VIO S118 R flyable subs or beneath VIO L210 modules to provide down fill. It can also serve as a safety interface for stacked configurations of VIO subs. The VIO S118 R sub houses a single 18-inch cone driver (with 4-inch voice coil) in a bass reflex configuration. It too is driven by a Digipro amplifier (1,600 watts RMS) working closely with DSP, specifically designed for maximum efficiency at the lower end of the frequency spectrum. Outfitted with both Power Factor Correction (PFC) and a Switch-mode power supply (SMPS), the amplifier is highly resistant to live voltage fluctuations. Also onboard is system auto-test for convenient diagnostics of both electronics and transducers, as well as delay for quickly establishing time-alignment, with a maximum of 62 milliseconds (ms) of delay available via the system’s Aurora Net networking platform and a maximum of 9.9 ms delay (with 0.1 ms steps) via the rotary dial on the back panel. Also onboard is a cardioid array configuration preset for applications requiring greater control of low-end sonic energy, particularly at the rear of the subs/arrays. Screenshot of Aurora Net, which supplies monitoring and control. The package is topped off with network flexibility, including an Audinate Dante Expansion Card as well as the previously noted Aurora Net platform that supplies complete real-time monitoring and control. 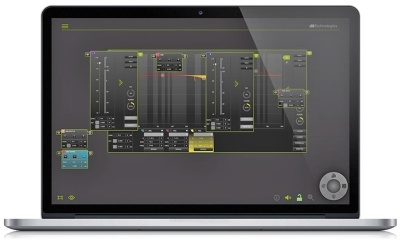 Cross-platform developed (Win, Mac OSX), it’s more than an evolution of the company’s previous network. Working via Ethernet cable (or via XLR) the software fosters customizable DSP control and digital audio management (via the Audinate Dante protocol) on the same cable. The layout has been designed for maximum usability and allows touch-oriented management on portable devices, with the workspace showing all main functions at a glance and operation through a single-click workflow. Both an entire system or each single element can be addressed due to a zoom-in/zoom-out incremental display feature. It all adds up to a system approach that can be expanded and adapted as needed with other VIO Series elements to present an exceptionally flexible package.